You know you’ve got crazy family when your aunt arrives at your house from Cape Town with a giant Kingklip, wrapped in cling wrap and foil. Yes, it was frozen and YES, she did fly with it in her suitcase from Cape Town. I was very grateful that she brought me such a nice gift but I was also shocked, and relieved that it didn’t start defrosting in between her clothes..yuck! Let me just start by saying that I KNOW Kingklip is considered Orange status on the SASSI list. I don’t buy it myself, ever, and I never order it in restaurants but this was a gift from a family member whom I love dearly so I was not going to tell her that I’m not accepting her gift. I knew I could fillet the already cleaned Kingklip but I just loved the way it looked ‘whole’ so I decided to cook it that way. But I was slightly out of ideas so I reverted to an Italian Cookbook I have. 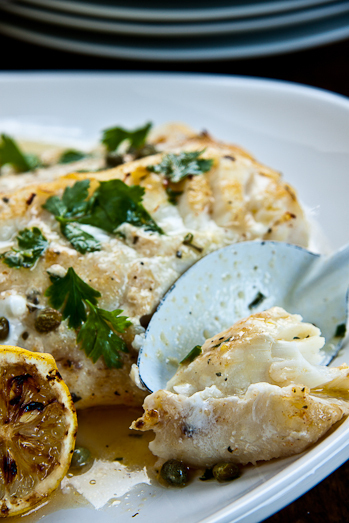 Scanning the pages I stumbled upon a recipe for pan-fried Sole with lemon butter and Capers and I knew I had to do just that, with my Kingklip. But instead of pan-frying it, I massaged it with some fish-spiced butter and layed it ever-so-gently onto a large roasting tray. As the fish baked, the aromas were intoxicating. I couldn’t leave my kitchen because I didn’t want to go away from the glorious smells escaping my oven. I made an incredibly easy lemon-garlic butter to go along with the fish and as my family wouldn’t be happy with just that, I roasted some baby potatoes with garlic and served everything with a big Greek salad. It was one of the most delicious meals I had in a long time and laying all the platters of food on the table made me so incredibly happy. Isn’t it amazing how satisfying it can be to cook a really great meal for your family? I suggest you try it this weekend. As for my weekend, I’m jetting of to Cape Town tomorrow to attend the Food & Wine Bloggers Indaba on Sunday. I am so excited to finally meet all the wonderful bloggers I’ve been be-friending over the last year and a bit and I can’t wait to see what will be hiding in my goodie bag, they have been rumoured to be incredibly, fantastically, wonderfully AWESOME! You can expect a post on all of the above mentioned next week sometime. And then, to end off this post, if you love wine (who doesn’t?) then hop over to the previous post and you stand a chance of winning a WHOLE CASE of the stuff! Yes, you heard right a whole case. And it’s as simple as pairing a bottle of Pinotage with a great meal/recipe. 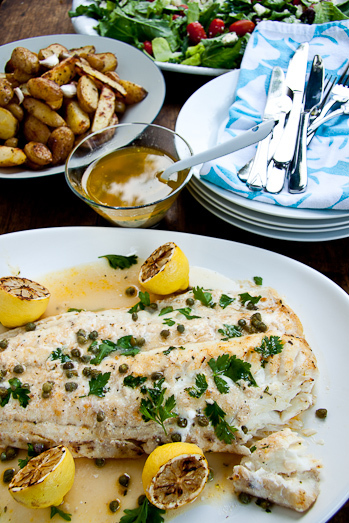 Place the fish on an oiled roasting tray and rub/brush the softened butter all over it. Sprinkle with the fish spice and cover with foil. Place in the oven and allow to bake/roast for 12-15 minutes and then remove the foil. Allow to bake/roast for another 5 minutes or until cooked throughout. 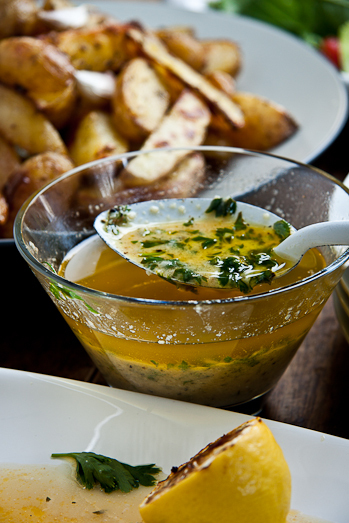 Meanwhile, melt the butter, garlic and lemon juice together in a small saucepan. Add the cream and mix well (I use my handheld blender at this point but it’s not essential). 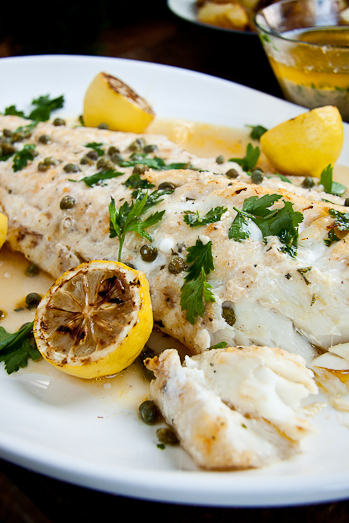 Serve the fish with a generous spoonful of the lemon-garlic butter and a good sprinkling of capers. Looking forward to trying this great sounding fish recipe. Can you tell me though is the fish spice a blend that you purchased or just a particular spice. Thanks so much for your help and for sharing your recipe. Judy, it’s a fish spice I bought at my local fish monger but any fish spice from the supermarket will do. Julia, whipping cream or heavy cream would both work well in this. 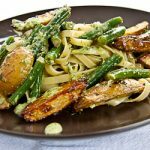 Let me know what you think of this recipe Danielle! Looks delicious! What kind of fish spice did you use? Looks great! My sister once flew from PTA to George with “waterblommetjies” freshly picked from our farm dam in her hand luguage….But than again, I think my whole family is certifiable! Lovely! Your aunt sounds like an interesting character – a whole fish in her suitcase, now that’s dedication. Always so scared of cooking whole fish, but you make it look effortless.